SUBHEAD: The data is telling us that from here, the extreme changes the world is experiencing will only accelerate. 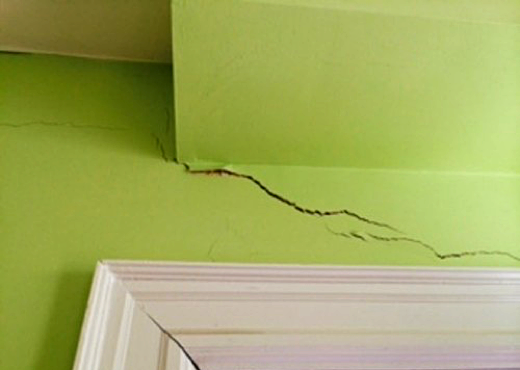 Image above: Stress cracks from shearing forces on door frame and through plaster wall from loss of structrural integrity. From (http://ths.gardenweb.com/discussions/2595490/holy-crack). The need to change is becoming more obvious than ever. The world is edging closer to the final moments after which everything will be forever changed. Grand delusions, perpetuated over decades, will finally hit the limits of reality and collapse in on themselves. We’re over-budget and have eaten deeply into the principal balances of all of our main trust accounts. We are ecologically overdrawn, financially insolvent, monetarily out past the Twilight Zone, consuming fossil fuels (as in literally eating them), and adding 80,000,000 net souls to the planet’s surface -- each year! -- without regard to the consequences. Someday there will be hell to pay financially, economically, and ecologically as there simply isn’t any way to maintain these overdrafts forever. Reality does not renegotiate. Its deal terms aren't compromisable. For those who have the neural plasticity to actually see what's happening around us, the changes are already here, blatant and frightening. Younger folks, with their fresher eyes and fewer ties to the past, can see them a lot easier than their elders. The prosperity enjoyed by the past few generations -- especially the Baby Boomers -- was stolen from future generations. All the while, they pretended as if their borrowing-heavy standards of living were the result of sheer genius and intelligence; like trust fund babies who mistake being born on third base for hitting a triple. Young people have sussed this out; and are now pulling back from many of the principal occupations of their forebears -- like marriage, babies and buying homes and cars. This perplexes older folks, who are beginning to find themselves increasingly at odds with the generations following after them. Humans can be very very smart, but the flip-side of our ingenuity is our capacity for self-delusion. We’ve very consistently preferred to look past our faults. That can work for a while, but eventually an incomplete view will lead to a complete disaster. For example: depleting our topsoils today to grow more eventually leads to a collapse of our food system tomorrow. Similarly, increasing societal complexity ultimately drains the resources out of an empire, until it withers and fails. Such is what we can learn from history. Each of these examples is rooted in the self-delusion that today's actions don't have real consequences. Money printing and its other historical debasement equivalents, serve to cover up (barely) critical signals. Derelict ideas that should die a quick death, instead, persist. Mis-priced money leads mal-investment (e.g., Italian junk debt selling with the same yield as ten year US Treasury debt!!). Extremely unfair redistributions of wealth from the bottom to the top result. Every. Single. Time. This time is no different. Image above: Note between 2001 and 2006 there was a small crest in financialization in Japan, but after the Fukushima Daiichi Meltdown occurred there as been a tidal wave of money printing. From original article. The Japanese money printers have gone hog-wild over the past decade. And they've had company. 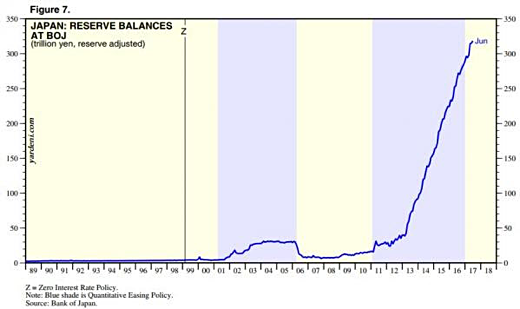 The other major central banks of the wold have been printing $trillions and $trillions, too, over the same time period. What will the repercussions be? The world is about to find out. But it’s actually far worse than that. For those who can bear to look, the signs of illness are as startlingly obvious as gangrene on a necrotic limb. Species are going extinct at an unprecedented rate. Frogs and insect populations are mysteriously collapsing. Massive destruction of the landscape as we chase the last low-EROEI fuels remaining (tar sands, and shale wells). Enormous human migrations away from economically and ecologically ruined areas (see: the MENA region). But the average citizen remains largely blind and/or numb to these. Again, much of this has to do with self-delusion that broken signals enable. People worry less as long as the stock markets are showing higher values, which is precisely why we don’t trust them anymore – they have become the most important signaling devices for The Powers That Be. They are far too important to leave to the vagaries of investors, and must be rescued/controlled/manipulated so that the “right” outcomes can be achieved. If we’re lucky when these financial delusions finally break, we’ll hopefully avoid a global war. That’s the usual route by which the politicians and bankers seek to avoid having to be held accountable for the colossal mistakes they made in the past. They drag everyone to in a manufactured confrontation, whooping up the populace into a fever pitch by inventing hobgoblins -- exactly as has recently happened in the US with the recent rash of Russia-phobia; a case study in how easily public perception can be manipulated (as well as proof-positive that critical thinking skills are no longer requirements for today's journalists). But if we’re unlucky, war may destroy much of what we take for granted and hold dear. Living standards will drop. The veil covering today's massive financial deception will be yanked off, revealing the shriveled, cold promises of past decades as being wholly incapable of meeting their obligation to fund millions of promised retirements. And if we’re really unlucky, that war could involve some horrendous new weapons that could cripple our nation's electrical grid (e.g., EMP, cyber attack). In which case, all of our individual attention and effort in the northern hemisphere will focus down to one simple task: surviving the first winter. In ways conscious and subconscious, we're becoming aware of the signs of growing instability around us. Like a flock of sheep catching the scent of an unseen predator, right now we’re collectively becoming increasingly nervous and stressed. People’s tempers are short with each other, criticisms fly easily, and stances are becoming hardened to ludicrous levels. Many don’t know why they're unhappy. And because they're unable to identify the source, they blame themselves. Instead of acting out, they act in. The deadly drug overdose epidemic that has been ravaging the nation may be even worse than we realize. A new University of Virginia study says the numbers of deaths due to heroin and opioid overdoses have actually been severely underreported. "Overall, 16.7 percent of 242 million U.S. adults reported filling one or more prescriptions for psychiatric drugs in 2013,” they wrote in the Journal of the American Medical Association’s JAMA Internal Medicine. If one in six Americans is being medicated for depression and/or anxiety, and another significant chunk are checking out via opioid numbing, perhaps we need to consider an alternative explanation for these facts: There’s something wrong with the world these people are inhabiting -- not with the people themselves. I have met countless people of great compassion and sensitivity, people who would describe themselves as "conscious" or "spiritual", who have battled with CFS, depression, thyroid deficiency, and so on. These are people who have come to a transition point in their lives where they become physically incapable of living the old life in the old world. So if you suffer from anxiety, maybe you don't have a "disorder" at all — maybe the house is on fire. Anxiety is simply the emotion corresponding to "Something is dangerously wrong and I don't know what it is." That is only a disorder if there is in fact nothing dangerously wrong. "Nothing is wrong, just you" is the message that any therapy gives when it tries to fix you. (Full disclosure, these past few years have not been easy on me, either. I prefer action and constructive motion, so the past few years have been like one of those dreams where you're desperate to move but your body remains frozen in place. I’ve wanted things to finally come to a head so we can at least begin the process of acknowledging our predicaments and facing them head on. The truth is that the lifestyle we're living today is vastly distant from the one humans evolved to value. Sebastian Junger explained to us in a podcast that returning veterans commit suicide at the rate of 22 per day largely because they experience such 'emptiness' upon reintegrating into civilian life. Unit cohesion in the military was so much more fulfilling and enriching that the prospect of a permanent return to what we call “US culture” leads many of them to conclude that suicide is the better option. If there's a more damning indictment of the current culture in the US, I don’t know of it. Our society's current plan is just not working. So why not square up to that reality, take charge and fix things while we still can? Why would we agree to persist in this dangerously broken state of affairs? In Part 2: Joining The Quiet Revolution, we explain how the signs of distress detailed above can be used to add urgency in making investments in your life that will make you happier, healthier, more engaged, and prosperous -- both today and tomorrow. The data is telling us that from here, the extreme changes the world is experiencing will only accelerate.